Is a lack of competition causing inequality in Australia? When I started studying economics I was 17. Young enough to be arrogantly skeptical of everything I heard. One of the many questions and concerns I had as I chomped through the stale bread of first-year economics was why we would believe that firms in competitive markets would put all their efforts into producing at lowest cost, when they could instead put their efforts into deterring competitors. What was assumed away in the basic competitive market theory we were learning was that firms will fight hard to protect their space. Few firms operate in the unrestrained markets where they live and die red in tooth and claw. Far more operate in spaces where competitors are kept at bay, by owning a key resource (Telstra, Rio Tinto) or by making sure regulations operate in their favour (Woolworths, Commonwealth Bank). Their operations are run with an eye on costs, sure, but also with an eye on the competition. Competition matters. Western countries run relatively unfettered capitalism because the prediction of competitive market theory is that capitalism will deliver more happiness, more efficiently. But competition is a key input to that theory. If competition falls short, we must question whether relatively unfettered markets are serving us best. Some new research from the United States shines an important light on competition. How America Became Uncompetitive and Unequal is a Washington Post op-ed that summarises a great body of work from non-partisan think tank the New America Foundation. It outlines how mergers and market power see prices pushed up and looks at how firms use their power to suppress workers’ wages. In Australia, competition policy has flickered through the news like a shooting star in the last few weeks, with a warning from ACCC head Rod Sims that privatisations are creating uncompetitive scenarios; and a Wikileak that suggests Australia’s financial sector would be exposed to competition if Australia signs a new Trade in Service Agreement. But we should wish on that shooting star, because competition is more important than ever. 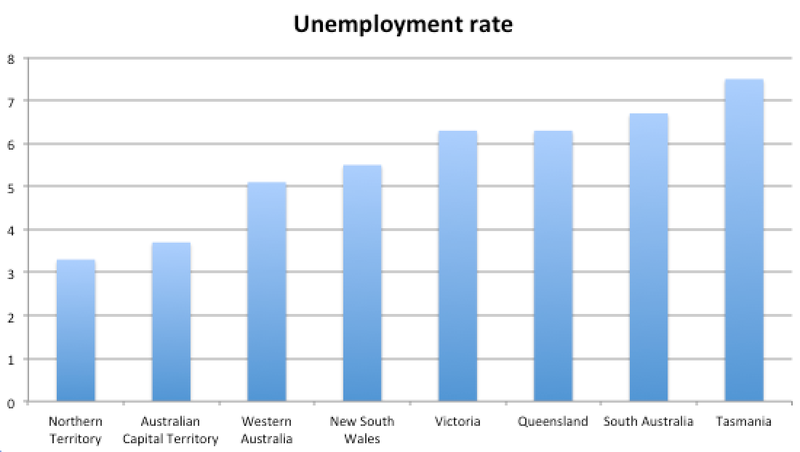 I’ve dived into the ABS figures to see what Australia looks like on the same issue. We don’t have as much historical data as America, but the numbers are just as striking. 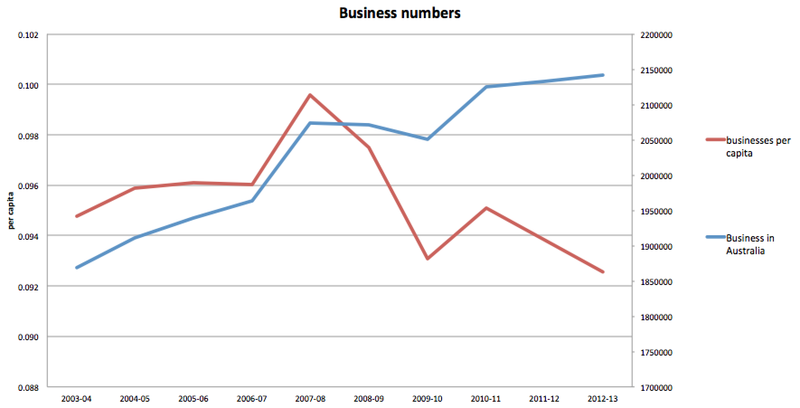 While Australia is home to ever more businesses, the number of businesses per person has fallen from nearly ten to closer to nine. 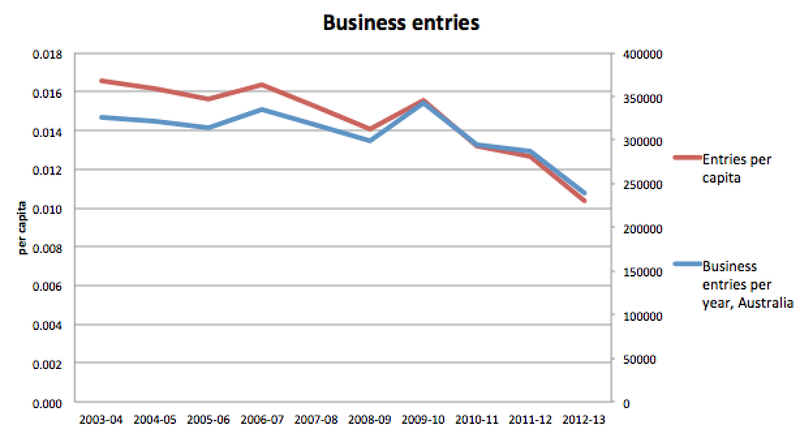 The explanation for this is in the willingness of Australians to open businesses. A decade ago, 900 new businesses were registered every day. Now it is under 700. This is not necessarily a bad thing. If people can have employment without risking their house on a business idea, then perhaps that’s a good thing. Perhaps something has changed in the economies of scale that mean our economy runs on fewer bigger businesses now. But the coincidence of rising inequality(1, 2) and higher market concentration makes the application of vigorous competition a huge priority for Australia. If rising inequality is explained by markets becoming more cosy than competitive, that is something we should act on as a matter of urgency. Competition is something both left and right should be able to get behind. The only people who support market power are plutocrats who grow fat on the cream churned up by insufficiently competitive systems. 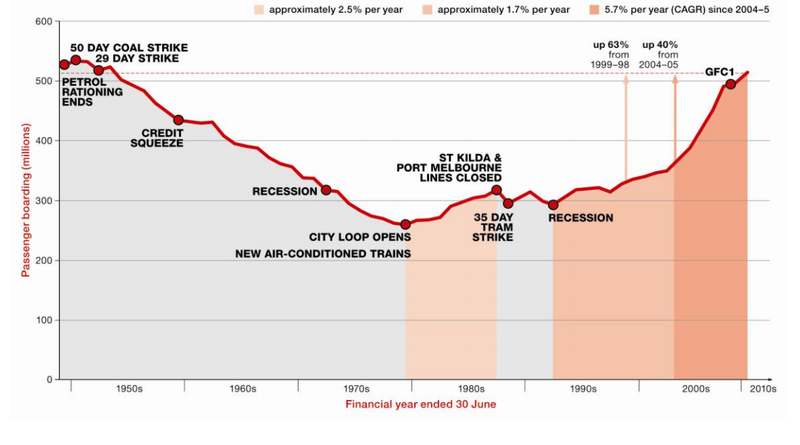 Posted on June 30, 2014 Author thomasthethinkengineCategories UncategorizedTags ACCC, competition, Economics, inequality, new america foundationLeave a comment on Is a lack of competition causing inequality in Australia? 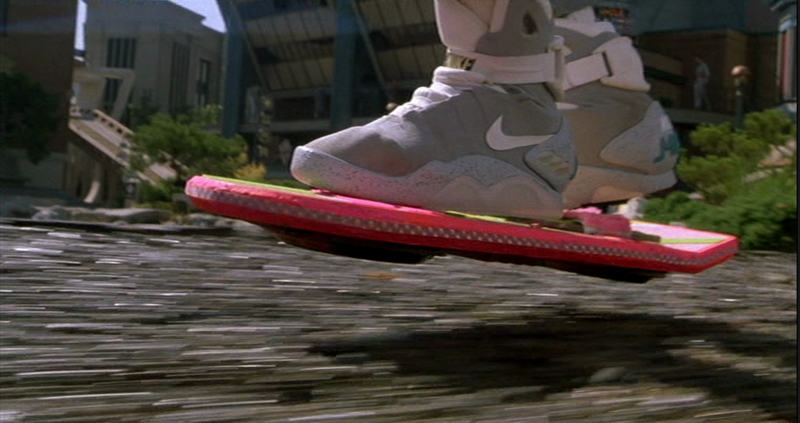 Wearables: more like social networks or hoverboards? Apple’s chance of first-mover advantage is zero. 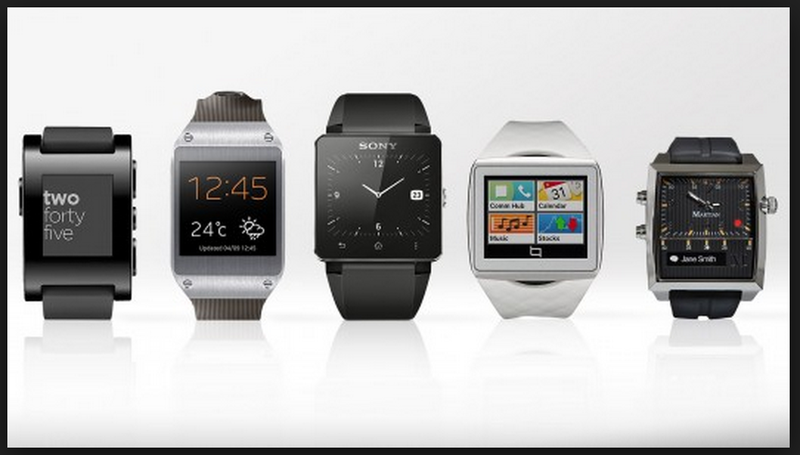 The smart watch market is already quite busy. Samsung and Google have products out. So do others. None is making much of a splash. We have a vision of tech breakthroughs as being radical new inventions. But really they stand on the shoulders of others. Here’s a little extract from an email I got in April 2005, when facebook was still mainly for ivy league students and working on attracting early stage investors. Apple is betting that its smartwatch will be like facebook. That it will enter a market that has been a graveyard for competitors and make them look foolish. You wouldn’t bet on any company that wasn’t Apple being successful. And the Apple of 2009 might have been able to make a smartwatch into a runaway smash hit. But is 2014 Apple equally savvy? Why Apple no longer innovates. Although there are clues that the backlash is mainly clickbait and the magic is still there. Investors are betting that the combination of fitness monitors and mini-notifications in the smartwatch will be just right. That it will click with the zeitgeist and zoom away until tehre are two types of people. Those who have an iWatch, and those planning to get one. But when a product already exists in the market, you have to really nail your version to capture the market. That’s an art, not a science, it requires judgment in the 99th percentile, not the 98th. There is evidence a company like Apple can continue to be good for a long time. But can it be very very good? I doubt it. The iWatch may not turn out not to be a facebook. It could be a hoverboard. Something from science fiction that is possible to produce, but turns out to have severe limitations. If that turns out to be the case, the iWatch will be a niche product and eager investors will lose a lot of money on Apple stock. Posted on June 26, 2014 Author thomasthethinkengineCategories UncategorizedTags apple, google, iwatch, smartwatch, smartwatches, wearablesLeave a comment on Wearables: more like social networks or hoverboards? Who would bother sponsoring the World Cup? The World Cup has dozens of sponsors. Companies like McDonalds, Sony and Budwesier, with a combined value of trillions of dollars. Are they wasting their money? The biggest PR win of the World Cup so far has been by headphone company Beats by Dre. “Neymar likes them Brazil-green. England’s Wayne Rooney, white. Luis Suarez, blue. The message is clear: players that are idols to kids around the world really want to wear Beats Headphones – if only the powers that be would get off their back! Somewhere, a PR agent is looking at a payslip with the biggest bonus they have ever seen. Just one of the many articles I linked to notes that the ban might be just what Beats was after. That kind of disruption shows business smarts and is probably why Apple recently paid $3 billion to acquire Beats. A sponsorship costs a lot. How much is a closely guarded secret, but possibly over a hundred million dollars for the top rung. FIFA is set to make $1.4 billion from sponsorship from this World Cup. Companies who don’t get their name on teh FIFA website don’t hang their heads and trudge home. They instead prepare for ambush marketing. At the last World Cup, a beer company called Bavaria Brewery reaped the spoils. 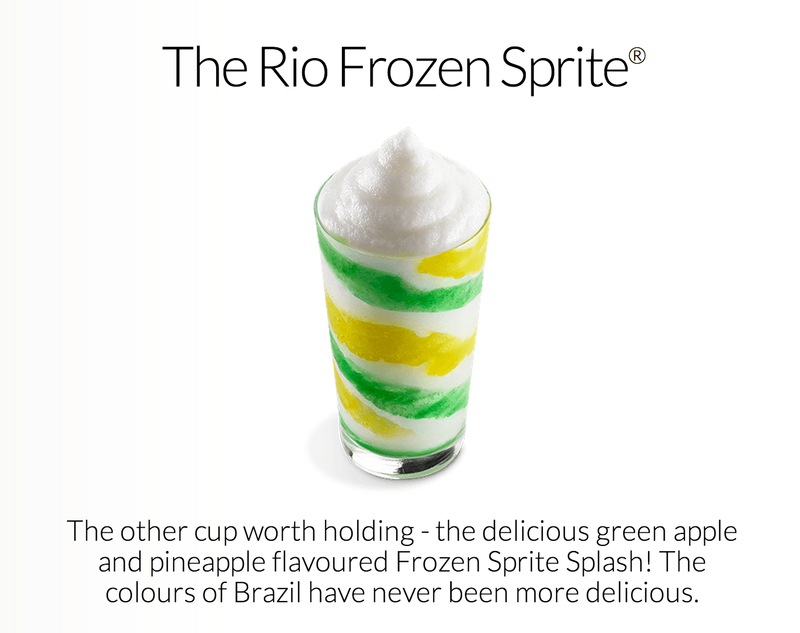 McDonalds is a major sponsor of the World Cup, but appears to be trying to run an ambush marketing campaign anyway, by making tie-in products with names they could have used even without buying a sponsorship. Coke and Pepsi are also battling it out for pre-eminence. Pepsi’s Rio-based ad shows that no matter how much you fence off a sponsorship, you can’t own the concept of football, the town where a tournament is based, or the personalities that bring it to life. Formal association with the tournament means dealing with FIFA – nothing to be proud of. Meanwhile, being associated with Lionel Messi is unambiguously good marketing. Consumers, meanwhile, have little idea who is a sponsor and who is not. 38 per cent think Mastercard sponsors the World Cup (wrongly), 42 per cent realise Visa does. If I were a shareholder in McDonalds or Coca-Cola, I’d understand. These are massive legacy brands that don’t want to yield an inch to competitors. But for the likes of Sony, Hyundai and Adidas, the decision to sponsor reeks of timidity and a lack of creativity. If they can’t think of a better way to spend their marketing dollar they should probably save it instead. Posted on June 25, 2014 Author thomasthethinkengineCategories UncategorizedTags ambush marketing, beats by dr dre, sponsorship, World Cup2 Comments on Who would bother sponsoring the World Cup? How much should we spend to get cycling up to 5 per cent of trips? 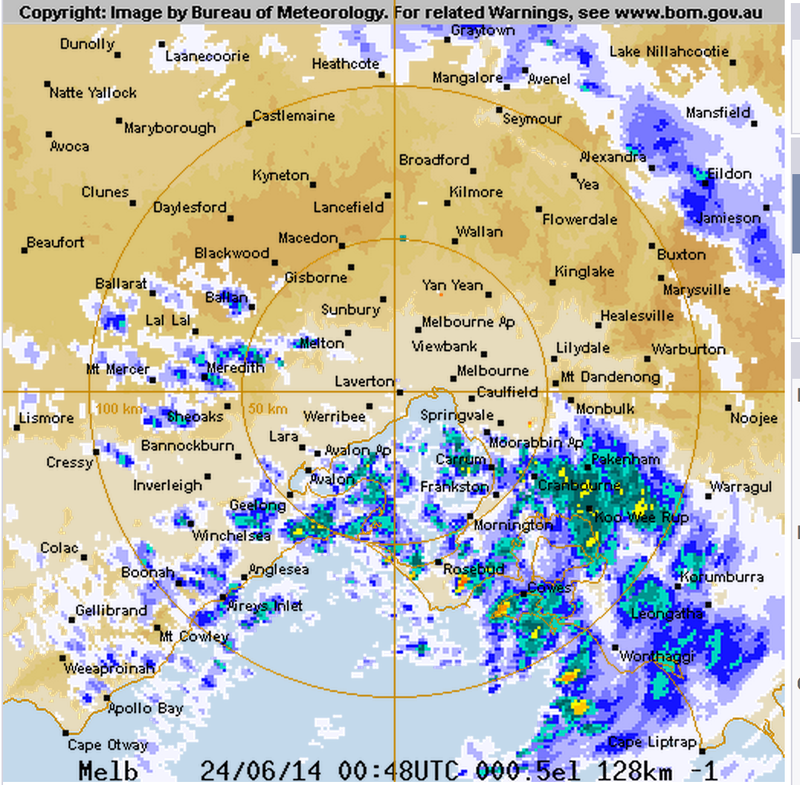 Melbourne’s weather is poor. It rains often. The city is huge – 100 km from edge to edge – and vast swathes of it are covered in the kind of densely packed contour lines that make cyclists legs tremble. 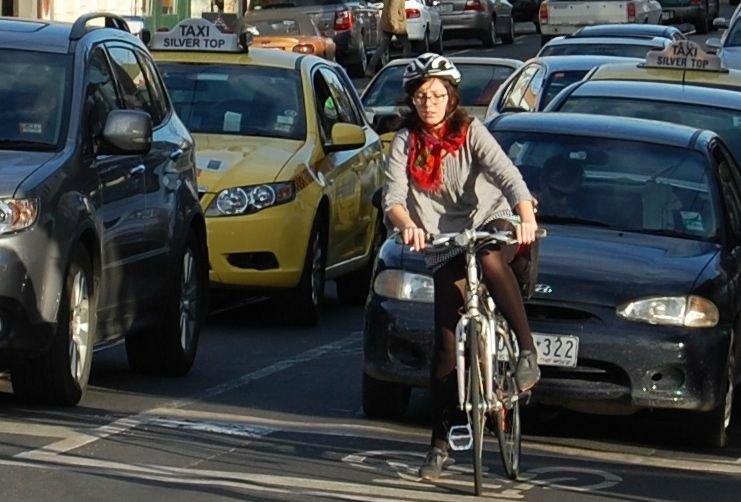 In winter, Melbourne’s cycling community shrinks by over a third. On days like today I suspect the number of cyclists is far smaller. 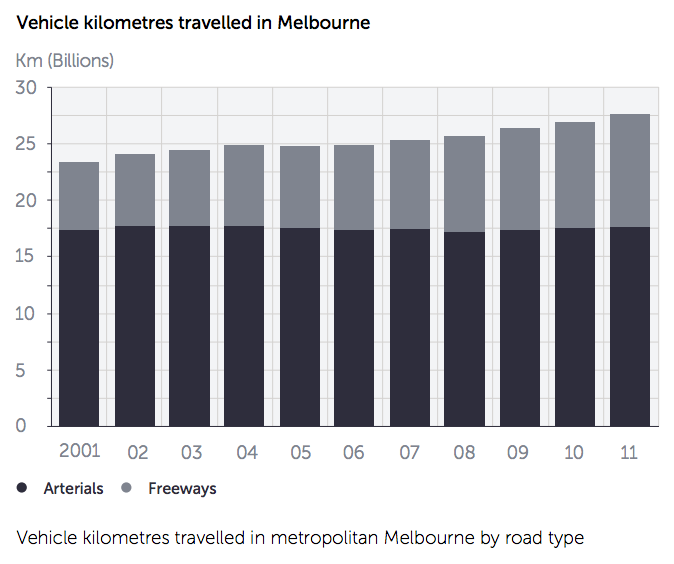 In short, Melbourne will never be the sort of city where 50 per cent of trips are possible by bike. Cycling (and walking) will never ever do the “heavy lifting” in our transport mix. That role will always be split between public transport and private motorised transport. 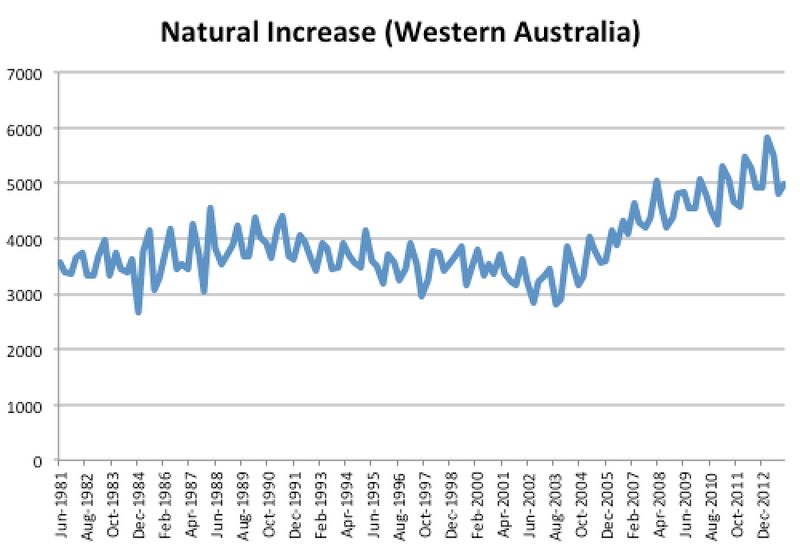 And vehicle kilometres have surged on freeways, while not increasing on arterial roads. Nationwide, spending on cycling is $112.8 million. Spending on roads is over 100 times more, at $18 billion. The data is tough to aggregate, but one estimate is that roads get four times the investment of public transport. All the modes are growing. How do we decide what the data means? And why not let the market decide what modes live or die? The answer to the second question is that transport is going to be a centrally planned space until we can charge users per kilometre. Public roads built to accommodate cars push the whole investment process into the world of “second-best.” If subsidising roads is a given, subsidising public transport can be efficient. Subsidising public transport makes policy makers wonder if there are other, cheaper ways to move people around, like bikes. So if we’re going to be centrally planning our transport mix, we must ask: do we like the current 78/17/5 mix? I’d argue we should not. I’d argue we should be aiming to grow the share of modes that have fewer negative externalities and greater returns to scale. I’d hazard a guess that for Melbourne, 10 per cent share evenly split between walking and bike, 30 per cent for public transport, and 60 per cent for cars would be optimal. Does that mean we should start spending 10 per cent of infrastructure funding on active modes, 30 per cent on public transport and 60 per cent on cars? Only if we want to move very very slowly. Infrastructure lasts a long time. 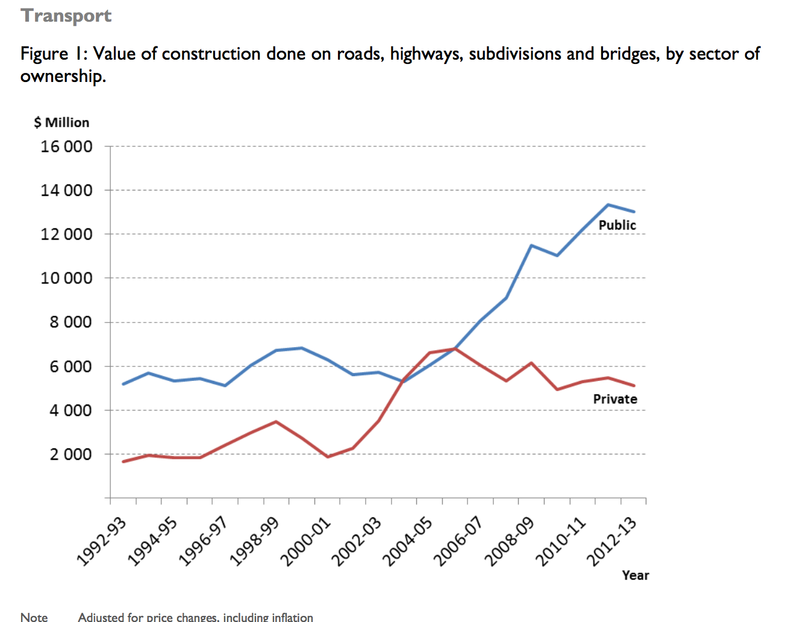 That means the stock of existing infrastructure is the single biggest determinant of infrastructure in five years time. Marginal changes in expenditure rates affect outcomes only very gently. If we want to effect change, we need to tip the scales massively in favour of the modes we want to grow, in the short term. That means that announcements like $650,000 for changes to a cycling bridge in Melbourne’s west should not be cause for widespread congratulation. 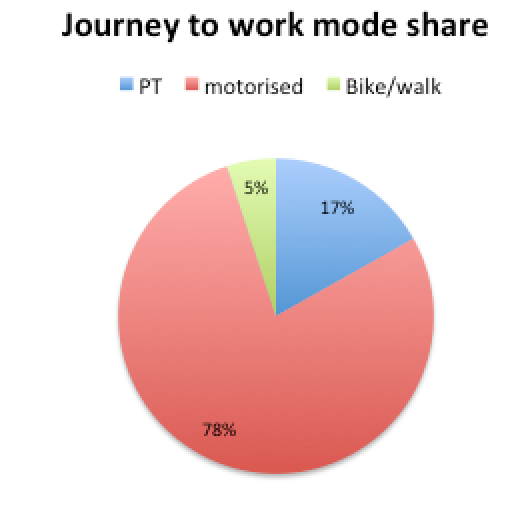 In the short term, we could probably usefully spend 60 per cent of the transport infrastructure budget on public transport and 15 per cent on active modes. If we did that for a few years, we would move swiftly towards the outcomes we want, before returning to a “maintenance” split, where expenditure is based on usage. Spending even $500 million a year on bicycle infrastructure might seem like a lot when the recent budget has been around $30 million. But when you look at what passes for “bicycle infrastructure” and imagine replacing it with global quality bicycle infrastructure, it would be a drop in the ocean. “Bike boxes” were the sine qua non of Melbourne bicycle infrastructure innovation just a few years ago. I don’t imagine gold-plated bicycle infrastructure should go everywhere. Far from it. Cycling infrastructure should be optimised in the areas where cycling can thrive, likely to be areas that already see some bicycle traffic. Fixing missing links, creating Copenhagen lanes on major on-road routes, plus widening and lighting off-street bicycle paths would be the top three priorities. If we want to increase the share of some modes, we need to be bold about throwing money at them, and not be afraid to acknowledge that such a move comes at the expense of other modes. 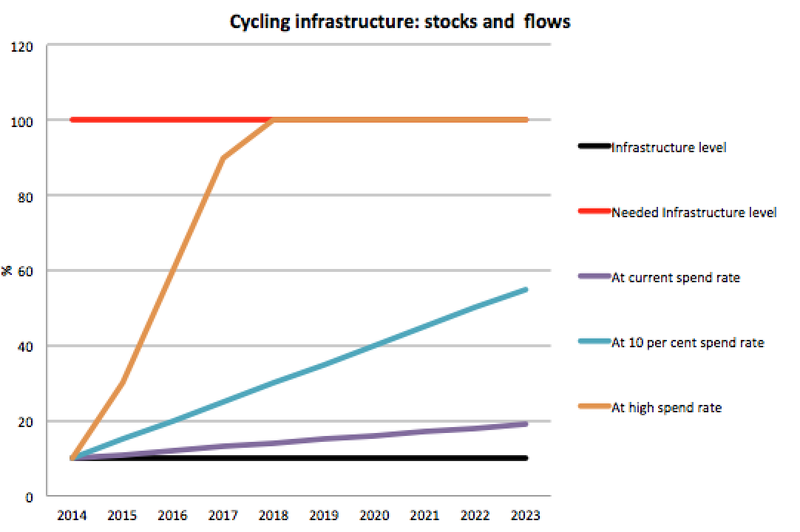 Posted on June 24, 2014 June 24, 2014 Author thomasthethinkengineCategories UncategorizedTags cycling, infrastructure, Melbourne, public transport, transit, transport1 Comment on How much should we spend to get cycling up to 5 per cent of trips? If change is constant, is it time to toss our coins? 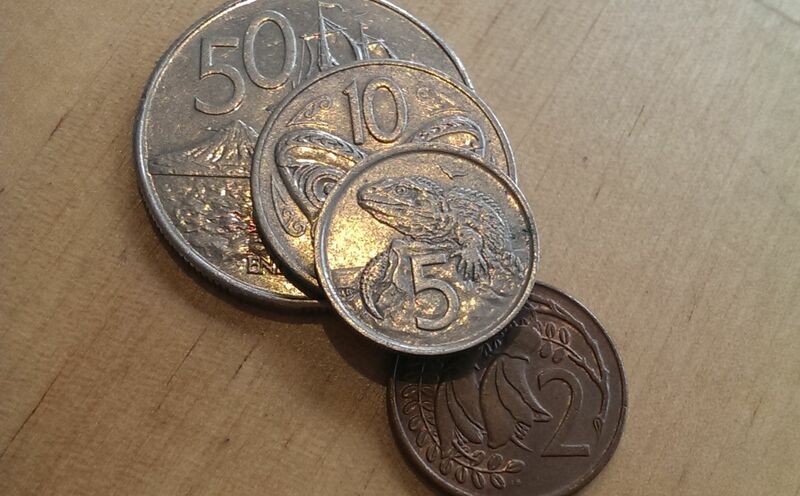 The Australian coin system is all wrong. The weight and bulk of our coins is disproportionately high, to the extent that some are worth over half as much as raw metal. 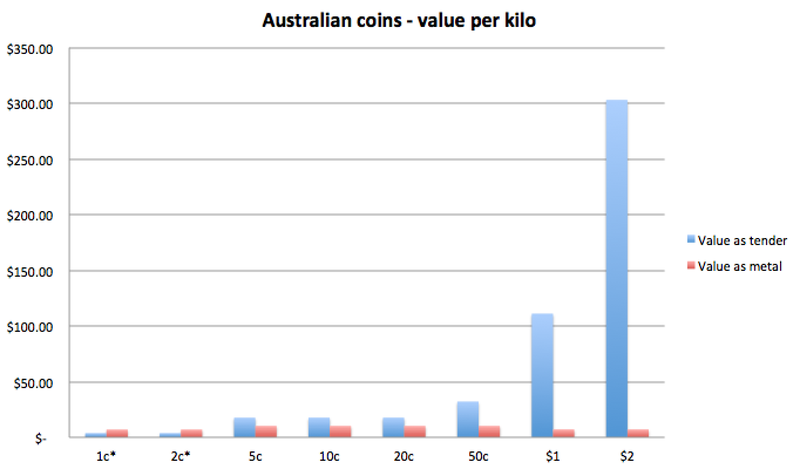 The 5-cent, 10-cent and 20-cent coins, which have a value of just $17.70 a kilo, are the worst offenders. 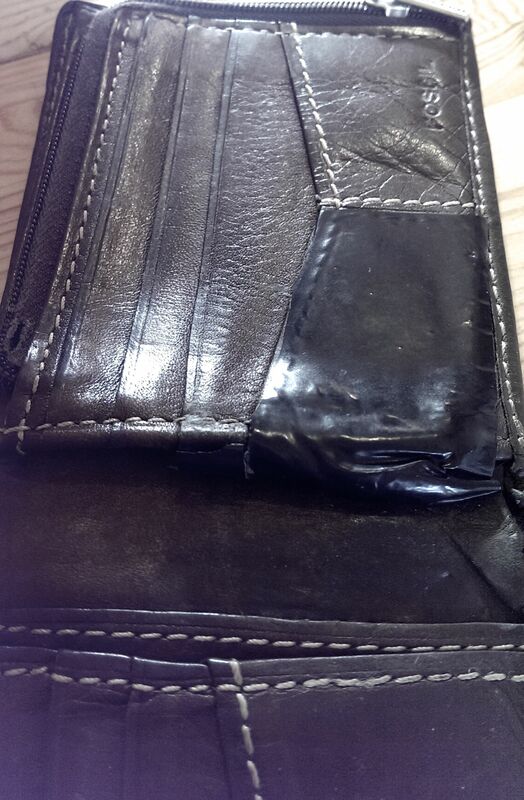 The economic damage wrought by Australia’s hefty loose change situation is serious, and I offer as exhibit A my old wallet, which had to be held together by electrical tape after the coin section busted its stitching. But it’s not just purses, wallets, and pockets being busted by heavy coins. Think of the petrol cost as armoured vans deliver tonnes of change around the city, especially to big coin users like supermarkets, pokie venues and public transport ticket machines. 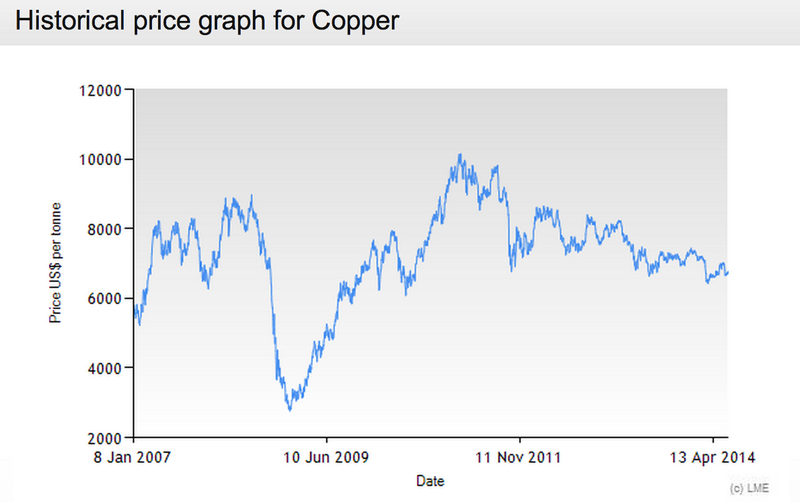 Even the Royal Australian Mint is at risk if copper prices rise. Copper represents 75 percent of our silver coins and 92 percent of our gold coins. The profit (seigniorage) that the mint makes on selling coins to the RBA was a not-insignificant $96 million in 2012-13. It would be crazy to put that upside at risk for the sake of big fat coins. During 2011, it looked like our coins might soon be worth melting down. The solution to these problems is obvious. 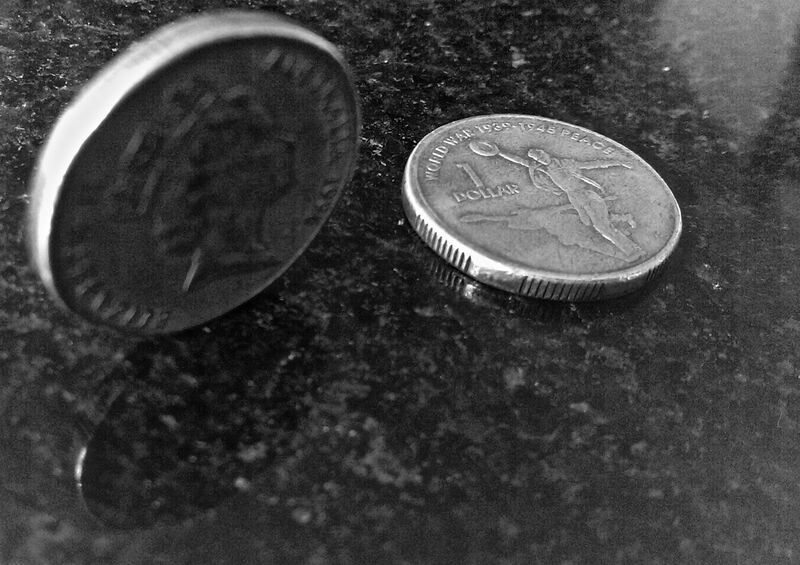 Smaller coins. We have the answer in front of our noses, in the shape of our $2 coin, whose outstanding value-to-weight ratio makes it the Bradman of coins. The $2 coin is the only one you’re actually pleased to find in your wallet. Introduced in place of the two dollar note in 1988, it’s worth keeping around. You never take a handful of them and dump them into a jar. The Canadians call their $2 coin a Toonie, yet for some reason, this nickname-mad nation has yet to come up with a diminutive for our Mighty Two. If we want to try to make our coins a bit more like the Mighty Two, we need not look far afield for a model. 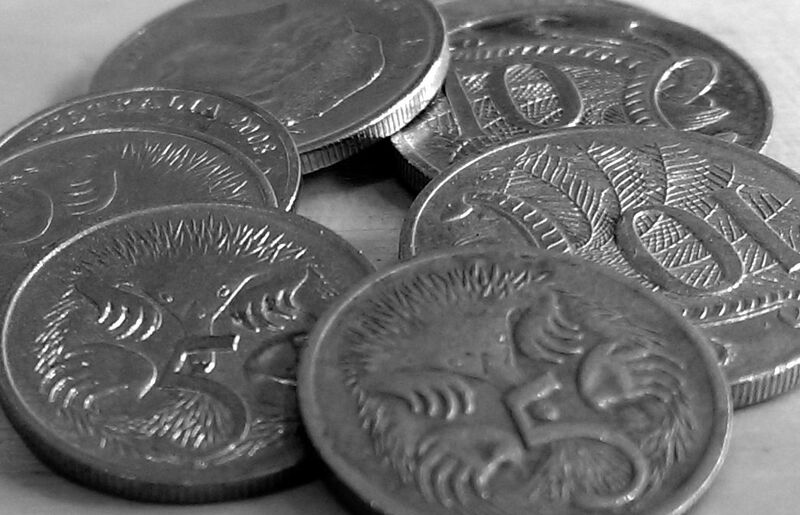 In 2005 New Zealand got rid of 5¢ coins and changed its 10¢, 20¢ and 50¢ coins from copper and nickel to plated steel. Their new coins are much smaller and much lighter than ours. Businesses who have to heft big bags of change back from the banks would welcome the change – you might imagine only the vending machine industry would object. But even they are increasingly moving towards electronic payments, because the industry wants to cut costs by diminishing the frequency with which it collects coins from its machines. The argument for smaller coins is a simpler one than the argument for getting rid of the smallest denomination. If you try to get rid of the 5-cent piece, everyone gets up in arms about supermarkets rounding up the price of things to the nearest ten. Never mind that this argument doesn’t hold water. It’s what keeps the pennies circulating in the US, and 5-cent pieces in Australia. The case for smaller coins is much simpler. Posted on June 23, 2014 Author thomasthethinkengineCategories UncategorizedTags change, coins, currency, mint, moneyLeave a comment on If change is constant, is it time to toss our coins? “It’s beautiful,” said the lecturer as he delivered the mathematical proof. “Why can’t the arts students just see this!” exclaimed the girl in the row in front of me. Classical Economics has some beautiful theories. John “beauty is truth” Keats may well have been a free-marketeer. But beautiful theories are a trap. The human brain has a wide range of biases, the most risky of which is a conclusion bias. We are inclined to latch on to an answer as soon as possible, which then goes on to frame our subsequent information gathering and processing. Of course, a beautiful unifying theory will be very tempting for us. Succumbing to that temptation explains a lot, from biblical literalists, to libertarians and communists. But the real world is very messy, and the project of the entire enlightenment is to get us engaged with that complexity and put aside our tendency to simplify. I’ve written about this problem before: I Haven’t Decided Yet. Some of the most intuitively appealing theories in history (e.g. from each according to his abilities, to each according to his needs) have proved unworkable. The point I’m driving at is well encapsulated by the parable of the fox and the hedgehog. An ancient Greek Poem turned into an essay by Isaiah Berlin, the Fox vs Hedgehog debate has been given a new life by statistical guru and seer Nate Silver. It classifies people into two groups, foxes – who rely on lots of little scraps of knowledge, and hedgehogs, who know one big thing. Nate Silver shows that in making predictions, having one big belief can be a block to seeing the future well, and being a fox is the better approach. I raise this issue now because I see two big examples where a simple, hedgehoggy application of economics seems to be taking sway. 1. Our federal government. A political fox willing to try anything to get into power, Tony Abbott turned into a policy hedgehog after occupying the Prime Minister’s Office. His latest budget is the repetition of one simple trick: apply market forces. From higher education to GP visits, via cuts to social security payments, the Budget tries to fix Australia by allowing the power of markets to seep in. It’s not nuanced but it is no doubt deeply satisfying to those elements of the base for whom the solution to the world’s problems is obvious. 2. Piketty. A French economist working on inequality, Mr Piketty has made an enormous splash in 2014. His very long book entitled Capital in the 21st Century considers a lot of evidence and distills it to one simple equation: r>g. That posits that the growth in inequality is due to a mathematical problem – the return on capital (r) is higher than the rate of growth (g). Existing stocks of wealth grow more than the paycheques of workers and so the world grows more unequal. I do not claim to be smart enough to prove that r<g, or that applying market forces to government services will always undermine them. But I hope to be smart enough to watch the debates unfold while remembering that a simple answer pleases a simple mind. How long until Tasmania is totally empty? 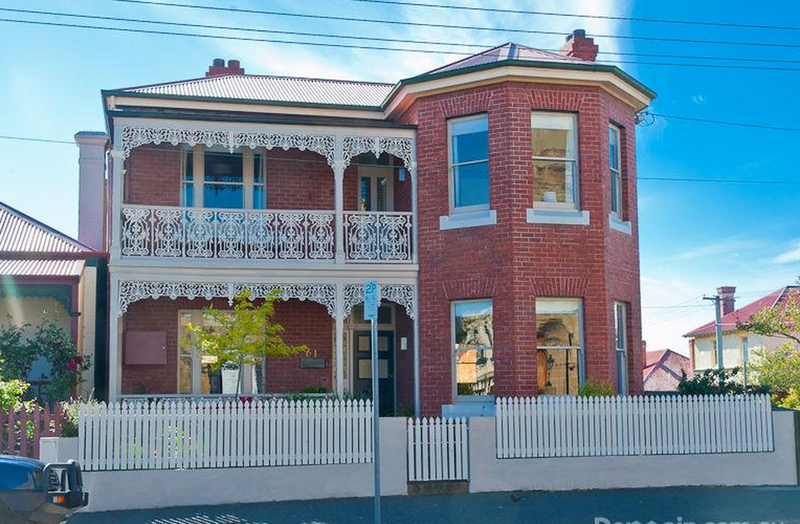 You can buy a fully renovated mansion on top of a hill in Tasmania for under $850,000. Did I mention that it is a mansion? It’s also in the heart of Tasmania’s capital city, 1.4 km from the waterfront. Even though a similar property in Melbourne would cost probably seven times as much, a multi-million dollar saving is apparently not enough to actually tempt people to live in Hobart. Demographic data out today show the Apple Isle circling the plug hole. Its population growth rate is not far from zero, and people continue to leave in large numbers. 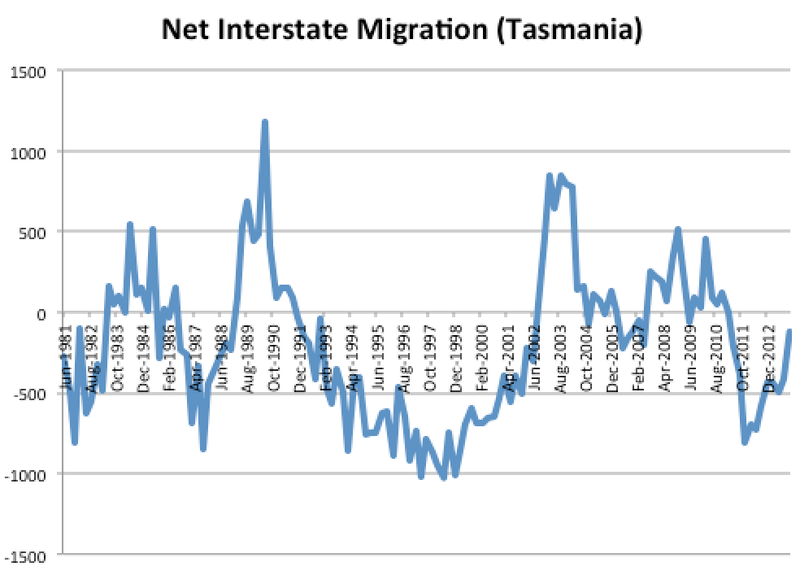 In the 36 years since 1981, Tasmania has managed to actually lose people to interstate migration, despite the Australian population more than doubling. They’ve been saved from extinction by overseas migration and the birth rate. But will that continue? The entire state has managed just 700 babies in the last six months, an amazing new low. The Tasmanian fecundity shortfall looks especially stark when you compare it to other states. WA has had 9800 babies in the last six months. The reason for Tassie’s child shortfall is not unguessable: Too few mums and dads, and too many grandmas and grandpas. How does Tasmania break out of this cycle? If mainland house price growth continues, there should eventually be push factors. Once the price of new housing in country Victoria and outer Melbourne starts to be much higher than the price of new housing in Tasmania, people might start moving there. 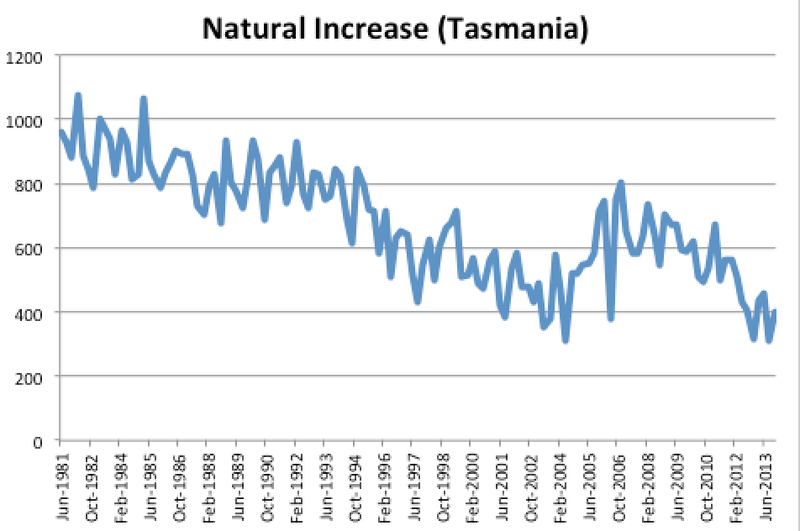 Also if climate change picks up, Tasmania will offer the last temperate zone in Australia. But that doesn’t offer much to Tasmania in terms of positive actions it can take. Another option I’ve canvassed is learning from the failure of the EU, and giving Tasmania its own monetary policy and currency (The Boonie). Essentially, the lesson of migration everywhere is that most people (except retirees) will move for jobs. That’s something Tasmania has too little of. How to fix? There are glimmers of hope in the data above. Australia’s next big boom will be looking after the aged. If Tasmania can turn itself into Australia’s Florida (the place to move when you retire), there should be lots of jobs in aged care. It just needs to convince the mainland-dwelling elderly that if they don’t want to work all the way to Tony Abbott’s new pension age, they should downsize to a much cheaper house on the other side of Bass Strait. That would bring an influx of wealth to the island, and provide for a lot of jobs. 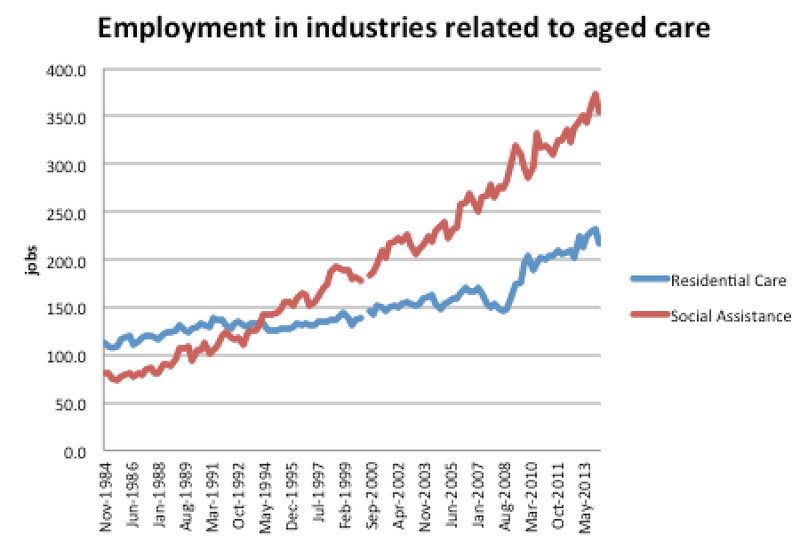 The aged care industry is already showing a lot of growth. 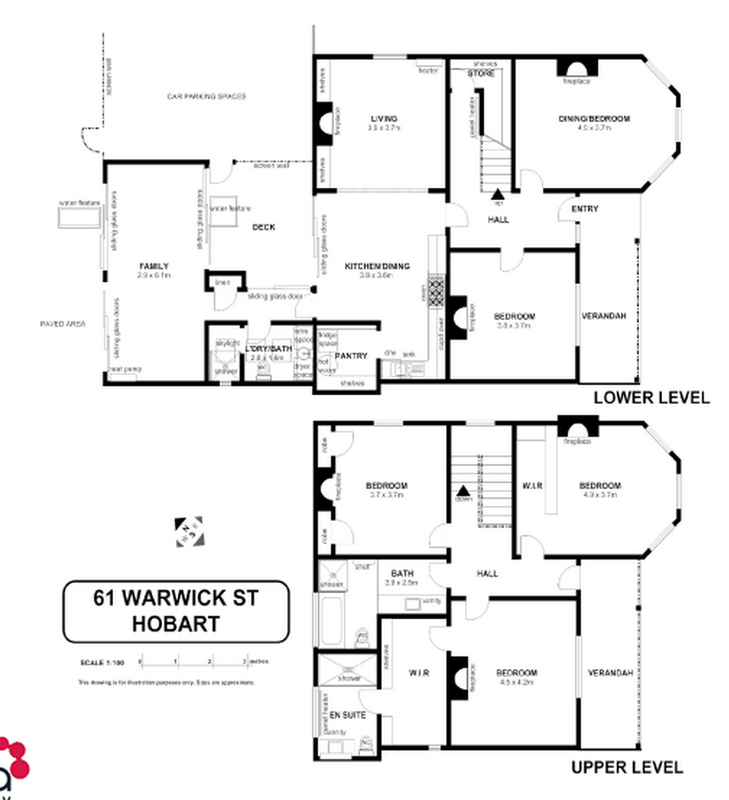 Can the Apple Isle fill those creaky old Hobart mansions with happy retirees? The key to Florida’s success has been “Weather, effective marketing, low taxes and a herd mentality.” Tasmania can match two of those already (good marketing and a retiree flow). Lower stamp duty for over-55s buying a new property might be a good policy move. As for the weather? It can’t do much more than it’s doing already, by logging those virgin forests and exacerbating climate change. 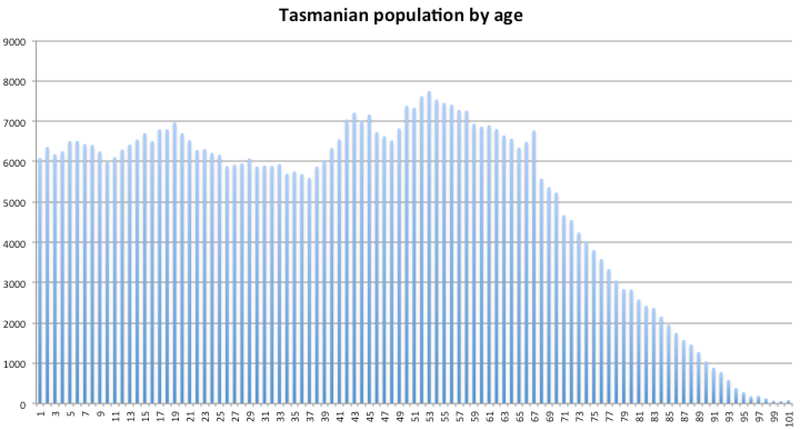 Posted on June 19, 2014 Author thomasthethinkengineCategories UncategorizedTags aged care, demographics, hobart, property prices, Tasmania3 Comments on How long until Tasmania is totally empty?